Established in 1948 (formerly as Walsh Engineering), Great Western Manufacturing is a broad based manufacturing business and offers a diverse range of services encompassing component manufacture, light to medium metal fabrication and assembly. Great Western Manufacturing is the Toowoomba based manufacturing facility of Great Western Corporation » and is strategically located at the cross roads of Queensland’s regional road network in Toowoomba - 120 kilometres west of Brisbane - and is easily accessible by road, rail and air, including the nearby Brisbane West Wellcamp airport. 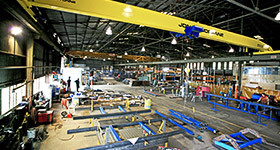 Great Western Manufacturing occupies 2.6 hectares consisting of two 4500 m2 production halls with overhead cranes and is is amongst Australia’s leading metal fabricators, machinists, manufacturers and finishers.